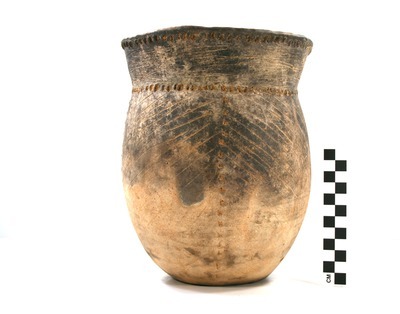 "41UR315, Burial 31, Vessel 168" by Timothy K. Perttula and Robert Z. Selden Jr.
DECORATION (INCLUDING MOTIF AND ELEMENTS WHEN APPARENT): The rim has two tool punctated rows, one at the top of the rim and the other at the rim-body juncture. The remainder of the rim has horizontal brushing marks. The vessel body has four panels defined by four vertical rows of tool punctations that extend from the rim-body juncture to near the base. Each panel is filled with diagonal incised lines, three with the incised lines pitched from left to right, and the fourth panel with the incised lines pitched from right to left. One of the panels is also bisected by a single vertical incised line. Pease Brushed-Incised jar, Vessel 168, Burial 31.